Winter. One of the best season of the year to target Esox on a fly-rod. Cold water and little vegetation get’s every baitfish on the move, followed closely by the Pike. This is the time of year when they gather in large groups, wether it be lakes, rivers, canals or something in between. In places where water is often a few degrees warmer, and fish find shelter against the blistering colds. Everything in the eco system has slowed down. Prime time Pike on the fly time! There are two types of Pikes when it comes to Winter fishing (this goes for both lure as well as fly-fishing). Some Pike can be found along the drop-offs into deep water near the schools of baitfish, on or near the bottom, while others can be just as easy lurking for an easy meal in the shallows. It is a completely miss-understanding that Winter Pike always go deep, and that you should always fish your fly as close to the bottom as possible. The only time when Pike are ”deep”, is when a any type of wheather front comes in, but they can be just as easily hidden in deep water, as they can be in the shallows in these type of conditions! So it’s up to you to find out! If you are like me, someone who likes to practise and enjoy alot of different techniques when it comes to fishing for Esox, than fly-fishing for Pike is something you shouldn’t go without. Catching Pike on a fly rod is a very exciting thing to do! Not only because you’ll be able to catch fish on your own home made streamers, but also because fly-fishing tackle is much lighter than the gear most of us use to go out lure fishing. Any Pike fly is different from one another, and the possibilities when it comes to fly-tying are endless! You can be your own magican and you are the one in control! But what kind of tackle do you need? Well, you make it as expensive as you possibly would want to. I have used the same fly-rod for years and years, and it never let me down. I was given an AFTMA 9 Temple Fork Outfitters Lefty Kreh Signature Series 1 as a birthday present 10 years ago, and used it ever since! This 9 weight rod, is a true allrounder. It can be used on big waters, but also on small, and makes catching fish of any size great fun! 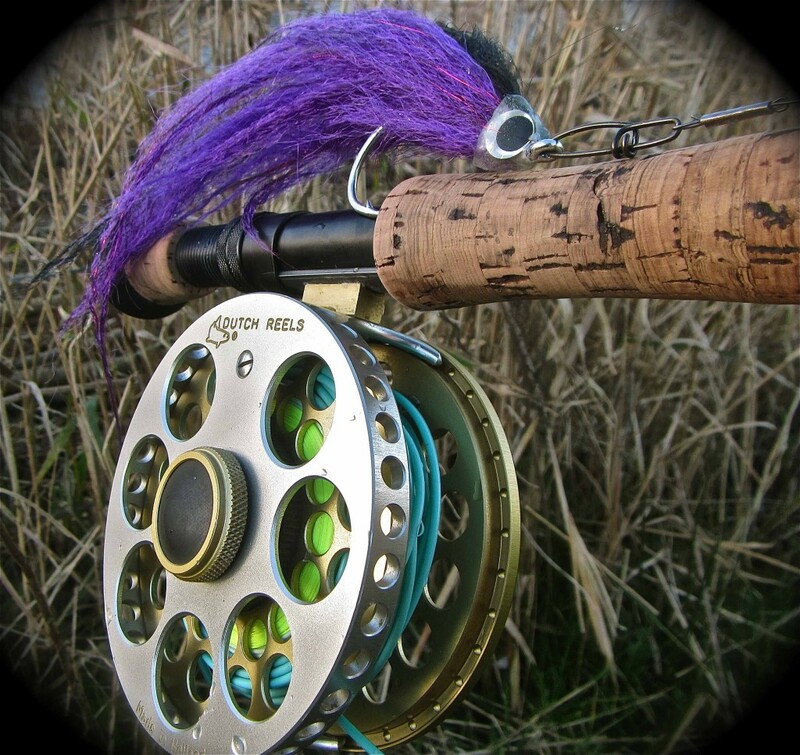 To top things off, I use a (limited edition) Aluminium ”Rio Grande” made by Dutch Reels and a floating WF9 fly-line. A 40 pound leader and 7×7 steel wire trace get the job done! Why a floating line and not an intermediate or sinking? Simply because mostly shallow waters are fished from 10ft down to zero, and don’t worry they will come up for your fly! When Pike go deeper, lures are used because they are much more effective in deep water, and you can also cover more water, because a lure has much more vibration in such wide open area’s of the deep. All you need is … and a EsoxOnly Deceiver! The best thing about any streamer, is that it can be fished dead slow. If you balance your fly correctly, it can sit still in the water column, something no Esox can resist. This ”hang” moment in time is when you get the most strikes! On some days when the fish is really inactive, slow fishing can be the trick in still catching Pike. The streamer as shown in the picture above, has an amazing tail waggle and the minimum amount of flash tied in seals the deal. In fly-fishing it’s all about these little details that make the difference. That’s the great thing about fly-fishing really, you can make your own flies, and give them any action you want! Now I don’t want to claim that you should always fish your streamers slow, in fact, fast fished ones can just as easy do the trick sometimes, but that all depends on what the fish want that day. Slow retreives and than suddenly fast again, can mimick a dying fish that wants to take a run when a ferocious predator is nearby. When fishing clear waters, always wear polaroid sunglasses, so you can see exactly what’s going on down below under the surface of the water, and anticipate to it, to take the most out of your retreive, and catch the most fish! The type of fly-fishing I do for Winter Pike, is from the shore. Why? Because the big water isn’t always friendly to us in this time of year. High winds can make it difficult or even dangerous to go out, and sometimes there is only little time between dawn and dusk. With a fly-rod you don’t need much time. You can go out, and catch fish with a minimum amount of equipment. While fishing with lures I always carry as much gear as I possibly can, when fly-fishing it’s the other way around. Strange thing isn’t it? When fly-fishing from shore it’s all about fishing! You don’t have the acces to any fish-finder, and need to follow your intuition. Where you think a predator can be lurking in the shadows. 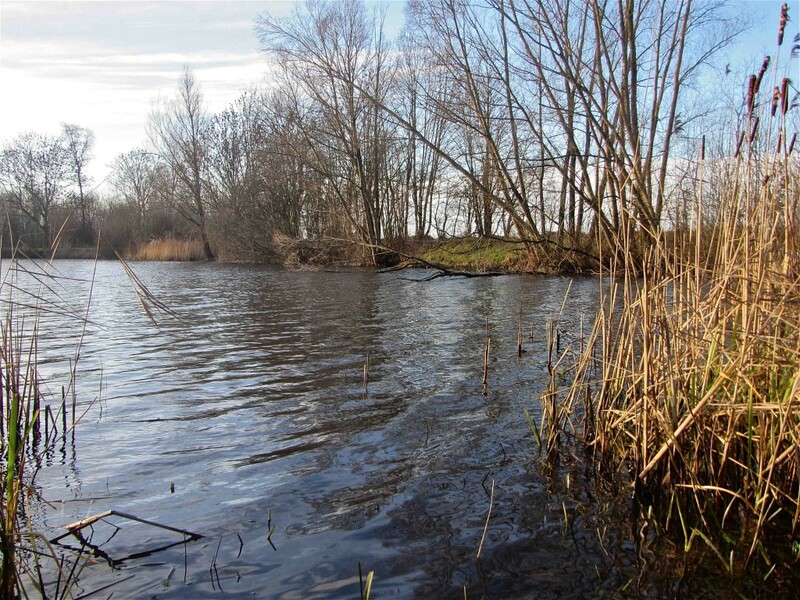 Under over hanging trees, reeds, between remains of weeds or structure like stones or timber hidden under the surface, provide great hiding places for Pike. And again, you don’t need to go really that deep! 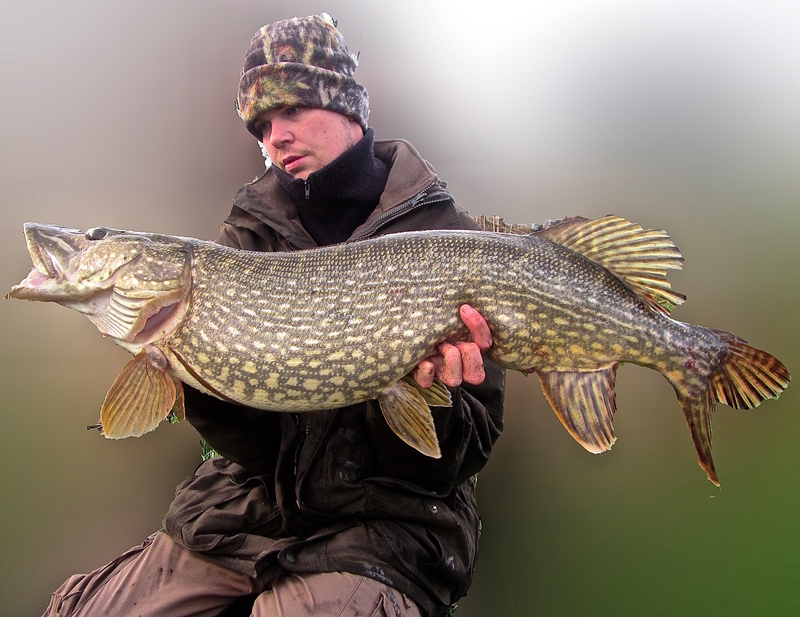 Active Pike will patroll the shallows looking for prey, so it’s only just a matter of time before one comes in contact with your fly, and if there’s one, there are always more, because Winter Pike are known to hunt in packs. They are the freshwater waterwolfs! This Pike has been on the hunt alot, according to his fat belly. In Winter, look out for clear water conditions. Pike are sight hunters, and in stained or turbid waters, they can miss your streamer. A streamer has less vibration than a lure, so they will easier go unnoticed. Like described earlier when it comes to approaching deep water Pike. And there’s another thing. In clear waters, most fish are much more shallow than in others. Weeds live much longer through the winter, because sunlight is able to penetrate better through clear water than it is to anything else. It wouldn’t be the first time that you’ll notice baitfish in the shallows in the deads of winter. And predators like the Pike, will never be far away! Winter fly-fishing takes place in all kind of different waters. 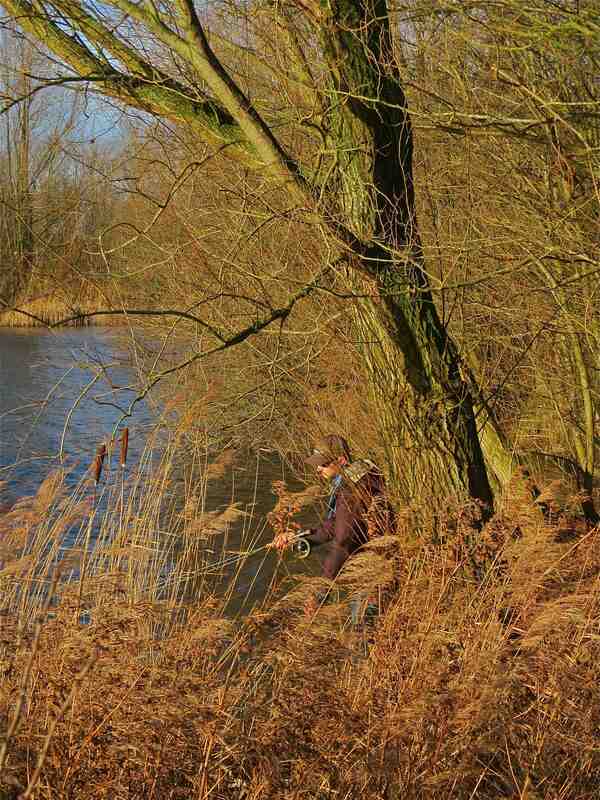 Lakes, rivers, channels, drains, fens, whatever you can find will hold Pike, and with a fly-rod you can fish waters. One of the best things about fishing clear waters, is that you can see everything that is going on. If you wear polaroid sunglasses, you can follow your streamer very securely underneath the surface. When there’s any Pike around, you’ll be often noticed by a shadow swimming underneath your fly. They follow your fly all the way up to the bank, and then lay there and just do nothing, or swim away. Pike are very curious creatures and they can drive an angler mad by not grabbing the fly as you would want it to. One way you can still trigger them to strike is dancing the streamer in front of their nose up and down, or from side to side. This sudden and erratic movement can often be that little extra they need to be convinced and take your fly. Winter Pike fly-fishing is all about being there at the right moment. In Winter, feeding times are limited and may vary from one water to another, but mostly the afternoon or the early morning are the best, and also probably one of the greatest times of day to be near the water. There’s something magical about being in these natural enviroments with no one around, surrounded by birds and wildlife. Nature at it’s very best. Move slowly when approaching the waters edge, you’ll never know what you might find under your own bank. Cast first, than walk ahead before doing otherwise. If you don’t catch at first, try again at some point later one. Winter Pike are always on the move looking for an easy meal, and not catching them in the first place doesn’t mean they’re not there. Like mentioned earlier, follow your intuition, and who knows, maybe you might run into a big reward in the end, on your own Winter Pike-Fly adventure! 42” Dream Pike on the fly, caught by Freddy!